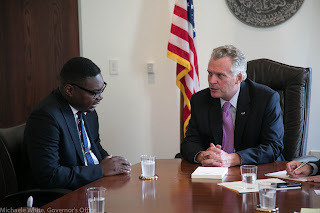 Miguel Ntutumu Evuna Andeme, Ambassador of the Republic of Equatorial Guinea accredited in the United States, recently met with the Honorable Terence R. McAuliffe, Governor of the Commonwealth of Virginia, to discuss the objectives of Equatorial Guinea’s economic diversification, which is part of the Horizon 2020 development plan. During the meeting, Ambassador Evuna Andeme reiterated the country’s efforts to attract foreign investment and explained the many advantages the country offers. Both parties talked about investment opportunities for businesses in the Commonwealth of Virginia in Equatorial Guinea’s public health, agriculture, ports, education and poultry sectors. 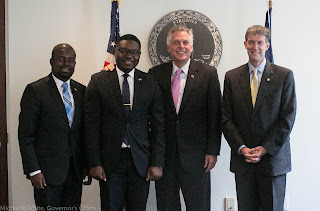 The first secretary of the Equatorial Guinea embassy in Washington, D.C., Roman Ekua Obama, and Virginia’s secretary of agriculture and forestry, Todd Haymore, were also present at the meeting. The government of Equatorial Guinea has made the development of the agricultural sector a major priority, including the revival of its once-thriving cacao sector, which produced some of the world’s highest-quality cacao for many years.